Matthew Perry just doesn't look well. Which will be even more evident in high-definition than on those relatively dinky screens provided by ABC's media site, the only place where TV critics can dial up review episodes of Mr. Sunshine. This isn't said to be mean. It's just that Perry's physical wear and tear are both apparent and disconcerting throughout the pilot episode, even though his lined, sagging mug is topped by an almost comical stack of thick reddish hair. Perry's acknowledged drug dependency during the Friends years seems to be taking its toll. So hey kids, you don't want to go there. Perry's Mr. Sunshine, premiering Wednesday, is temporarily replacing Cougar Town, which stars his old Friends running mate, Courteney Cox. She still looks luminous at age 46 in real life. He's starting to look like hell at age 41. Again, it's noticeable enough to remark on. OK, on with the show, which is disappointingly flat. Perry plays Ben Donovan, manager of a San Diego arena called the Sunshine Center. He's turning 40 when we first meet him. At the same time, his recurring bedmate Alice (Andrea Anders), who's also the marketing director, decides to break it off and instead commit to Ben's assistant, Alonzo (James Lesure), a former basketball star. Gee, and Ben was just starting to feel a bit more lonely and a bit less self-absorbed. Problem is, it's hard to care a whit when Alice tells him, "No one is the answer for you, because you only think of yourself." Viewers might feel even less for Ben's boss, Crystal (multi-Emmy winner Allison Janney), who owns the arena and is both egocentric and neurotic. Plus, she has little use for her plus-sized but cheery son, Roman (Nate Torrence), whom Crystal has all but discarded. Still, she wants Ben to find something for him to do at the arena. Manchild Roman so far is the show's most appealing character, but not to the point where you'd watch Mr. Sunshine just to see him. There's also a two-bit drop-in by Jorge Garcia (Hugh "Hurley" Reyes from Lost), who has a throwaway cameo role as a maintenance guy. 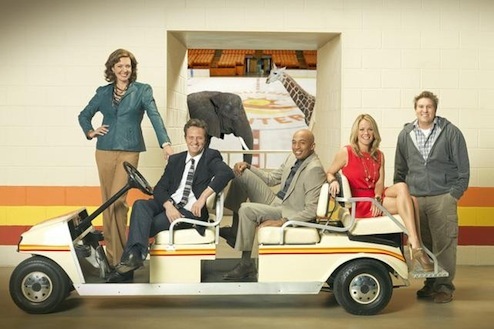 Other less than riveting subplots in the opening episode are an escaped elephant, a rush to rid the arena of hockey ice in time for the circus and Crystal's big showy presentation of a check to the San Diego Kids Club. "Where's the Asian kid? I specifically requested an Asian kid," she demands before singing a song on behalf of racial harmony that's cringe-worthy while also being completely stupid and unfunny. Then it's time to send in the ax-wielding clowns -- literally. Cougar Town already suffers a considerable audience fall-off from ABC's preceding Modern Family. Nonetheless it's been renewed for next season, and continues to improve its content if not its ratings. Decidedly dreary for openers, Mr. Sunshine succeeds in making Cougar Town look like a lion of the prime-time jungle. That's obviously not the intent. But Perry, Janney and company will have to brighten matters in a hurry to avoid a very quick sunset.